BABYLON ( , LXX. Bαβυλών). The chief city of Babylonia, long the capital of the kingdom and empire that controlled the whole or a large part of the valley of the Tigris and Euphrates. This city has several names or appellatives in the native inscriptions, the chief being "Ka-dingira" and "Babu-ili" ("gate of God" or "gate of gods"), "Tintir" ("seat of life"), and "E" or "E-ki" ("House"). The Hebrew tradition groups it with "Erech, Accad, and Calneh" (Gen. x. 10), and so ascribes to it great antiquity; though it should be added that the beginnings of the city can not be historically determined. No native records give any clue to its origin. It appears to be mentioned in a historical inscription by Agu-kak-rime (about 1650 B.C. ), who restored the shrines of Marduk and Sarpanit in the temple of E-sagila. But the city had long before been the center of a vigorous political life. In the beginning it was but one among many cities; but it speedily rose to prominence, and its history is practically the history of Babylonia. 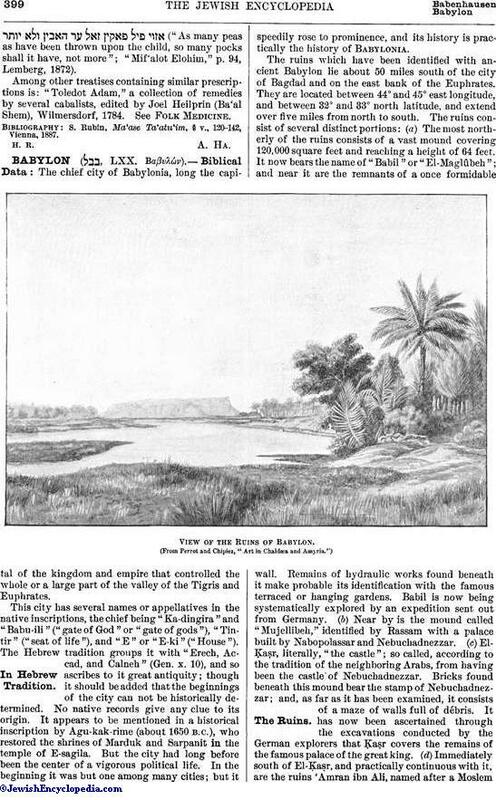 View of the Ruins of Babylon. The ruins which have been identified with ancient Babylon lie about 50 miles south of the city of Bagdad and on the east bank of the Euphrates. They are located between 44° and 45° east longitude, and between 32° and 33° north latitude, and extend over five miles from north to south. The ruins consist of several distinct portions: (a) The most northerly of the ruins consists of a vast mound covering 120,000 square feet and reaching a height of 64 feet. It now bears the name of "Babil" or "El-Maglûbeh"; and near it are the remnants of a once formidable wall. Remains of hydraulic works found beneath it make probable its identification with the famous terraced or hanging gardens. Babil is now being systematically explored by an expedition sent out from Germany. (b) Near by is the mound called "Mujellibeh," identified by Rassam with a palace built by Nabopolassar and Nebuchadnezzar. (c) El-Ḳaṣr, literally, "the castle"; so called, according to the tradition of the neighboring Arabs, from having been the castle of Nebuchadnezzar. Bricks found beneath this mound bear the stamp of Nebuchadnezzar; and, as far as it has been examined, it consists of a maze of walls full of débris. It has now been ascertained through the excavations conducted by the German explorers that Ḳaṣr covers the remains of the famous palace of the great king. (d)Immediately south of El-Ḳaṣr, and practically continuous with it, are the ruins 'Amran ibn Ali, named after a Moslemsaint whose tomb is visited by pilgrims. The ruins cover the site of the great temple of E-sagila. (e) Near the village of Jumjuna are small mounds, from one of which have been taken numbers of business tablets whose inscriptions make it plain that the site was once covered with the offices of the firm of the sons of Egibi. Besides these chief ruins there are numbers of smaller ruin-groups; but their relations to each other are more or less obscure, and identification of the buildings which they mark is either doubtful or wholly lacking. This mound is now being explored by the expedition undertaken by German scientists. Herodotus (i. 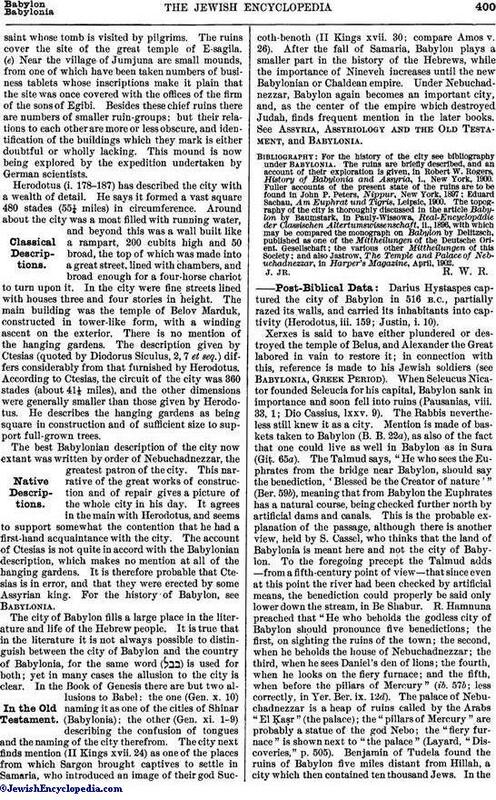 178-187) has described the city with a wealth of detail. He says it formed a vast square 480 stades (55¼ miles) in circumference. Around about the city was a moat filled with running water, and beyond this was a wall built like a rampart, 200 cubits high and 50 broad, the top of which was made into a great street, lined with chambers, and broad enough for a four-horse chariot to turn upon it. In the city were fine streets lined with houses three and four stories in height. The main building was the temple of Belov Marduk, constructed in tower-like form, with a winding ascent on the exterior. There is no mention of the hanging gardens. The description given by Ctesias (quoted by Diodorus Siculus, 2, 7 et seq.) differs considerably from that furnished by Herodotus. According to Ctesias, the circuit of the city was 360 stades (about 41⅓ miles), and the other dimensions were generally smaller than those given by Herodotus. He describes the hanging gardens as being square in construction and of sufficient size to support full-grown trees. The best Babylonian description of the city now extant was written by order of Nebuchadnezzar, the greatest patron of the city. This narrative of the great works of construction and of repair gives a picture of the whole city in his day. It agrees in the main with Herodotus, and seems to support somewhat the contention that he had a first-hand acquaintance with the city. The account of Ctesias is not quite in accord with the Babylonian description, which makes no mention at all of the hanging gardens. It is therefore probable that Ctesias is in error, and that they were erected by some Assyrian king. 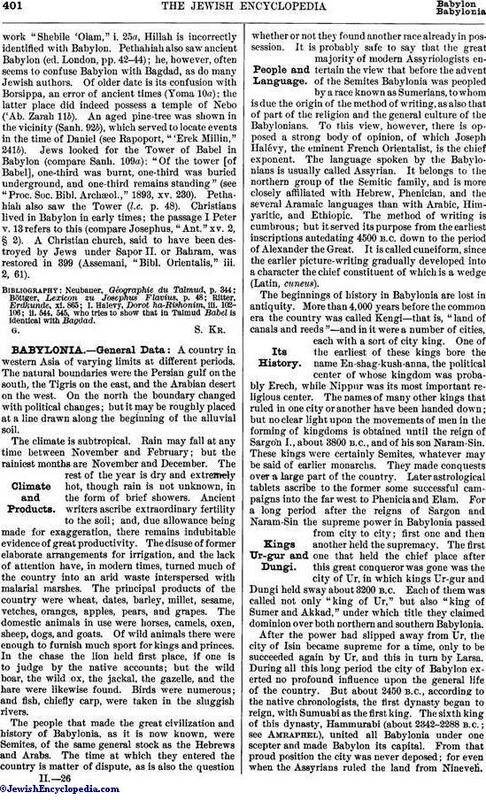 For the history of Babylon, see Babylonia. The city of Babylon fills a large place in the literature and life of the Hebrew people. It is true that in the literature it is not always possible to distinguish between the city of Babylon and the country of Babylonia, for the same word ( ) is used for both; yet in many cases the allusion to the city is clear. In the Book of Genesis there are but two allusions to Babel: the one (Gen. x. 10) naming it as one of the cities of Shinar (Babylonia); the other (Gen. xi. 1-9) describing the confusion of tongues and the naming of the city therefrom. The city next finds mention (II Kings xvii. 24) as one of the places from which Sargon brought captives to settle in Samaria, who introduced an image of their god Succoth-benoth (II Kings xvii. 30; compare Amos v. 26). After the fall of Samaria, Babylon plays a smaller part in the history of the Hebrews, while the importance of Nineveh increases until the new Babylonian or Chaldean empire. Under Nebuchadnezzar, Babylon again becomes an important city, and, as the center of the empire which destroyed Judah, finds frequent mention in the later books. See Assyria, Assyriology and the Old Testament, and Babylonia. and also Jastrow, The Temple and Palace of Nebuchadnezzar, in Harper's Magazine, April, 1902. Darius Hystaspes captured the city of Babylon in 516 B.C., partially razed its walls, and carried its inhabitants into captivity (Herodotus, iii. 159; Justin, i. 10). Xerxes is said to have either plundered or destroyed the temple of Belus, and Alexander the Great labored in vain to restore it; in connection with this, reference is made to his Jewish soldiers (see Babylonia, Greek Period). When Seleucus Nicator founded Seleucia for his capital, Babylon sank in importance and soon fell into ruins (Pausanias, viii. 33, 1; Dio Cassius, lxxv. 9). The Rabbis nevertheless still knew it as a city. Mention is made of baskets taken to Babylon (B. B. 22a), as also of the fact that one could live as well in Babylon as in Sura (Giṭ. 65a). The Talmud says, "He who sees the Euphrates from the bridge near Babylon, should say the benediction, 'Blessed be the Creator of nature'" (Ber. 59b), meaning that from Babylon the Euphrates has a natural course, being checked further north by artificial dams and canals. This is the probable explanation of the passage, although there is another view, held by S. Cassel, who thinks that the land of Babylonia is meant here and not the city of Babylon. To the foregoing precept the Talmud adds —from a fifth-century point of view—that since even at this point the river had been checked by artificial means, the benediction could properly be said only lower down the stream, in Be Shabur. R. Hamnuna preached that "He who beholds the godless city of Babylon should pronounce five benedictions; the first, on sighting the ruins of the town; the second, when he beholds the house of Nebuchadnezzar; the third, when he sees Daniel's den of lions; the fourth, when he looks on the fiery furnace; and the fifth, when before the pillars of Mercury" (ib. 57b; less correctly, in Yer. Ber. ix. 12d). The palace of Nebuchadnezzar is a heap of ruins called by the Arabs "El Ḳaṣr" (the palace); the "pillars of Mercury" are probably a statue of the god Nebo; the "fiery furnace" is shown next to "the palace" (Layard, "Discoveries," p. 505). Benjamin of Tudela found the ruins of Babylon five miles distant from Hillah, a city which then contained ten thousand Jews. In thework "Shebile 'Olam," i. 25a., Hillah is incorrectly identified with Babylon. 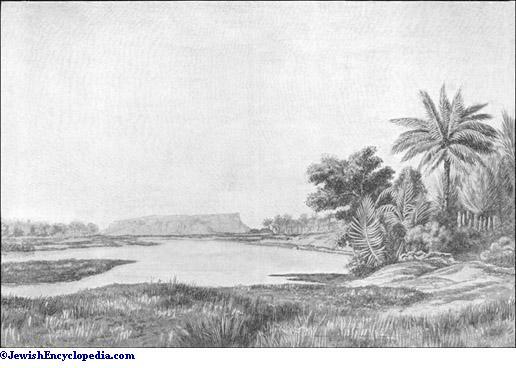 Pethahiah also saw ancient Babylon (ed. London, pp. 42-44); he, however, often seems to confuse Babylon with Bagdad, as do many Jewish authors. Of older date is its confusion with Borsippa, an error of ancient times (Yoma 10a); the latter place did indeed possess a temple of Nebo ('Ab. Zarah 11b). An aged pine-tree was shown in the vicinity (Sanh. 92b), which served to locate events in the time of Daniel (see Rapoport, "'Erek Millin," 241b). Jews looked for the Tower of Babel in Babylon (compare Sanh. 109a): "Of the tower [of Babel], one-third was burnt, one-third was buried underground, and one-third remains standing" (see "Proc. Soc. Bibl. Archæol.," 1893, xv. 230). Pethahiah also saw the Tower (l.c. p. 48). Christians lived in Babylon in early times; the passage I Peter v. 13 refers to this (compare Josephus, "Ant." xv. 2, § 2). A Christian church, said to have been destroyed by Jews under Sapor II. or Bahram, was restored in 399 (Assemani, "Bibl. Orientalis," iii. 2, 61). I. Halevy, Dorot ha-Rishonim, iii. 102-106; ii. 544, 545, who tries to show that in Talmud Babel is identical with Bagdad.